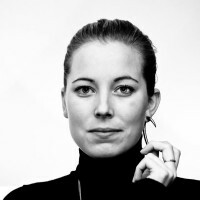 Pauline van Dongen (Amsterdam, 1986) is a Dutch fashion designer specialized in wearable technology. As a creator interested in the notion of interactivity in fashion, she researches the human body in relation to its surroundings. To her, technology is not a mere tool, but rather one of aesthetics. There’s a strong focus on materiality in her work and the way it’s capable of enhancing expression and performance of the body. Working closely with varying entities from the field of science and innovation, studio Pauline van Dongen aims to merge fashion and technology while breathing life into scientific creations.